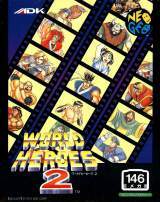 World Heroes 2 © 1993 ADK Corp.
AES release. For more information about this game itself, please refer to the original MVS entry; "World Heroes 2 [Model NGM-057]". This AES version was released on June 04, 1993 in Japan and in the United States of America (two months after the MVS release).